Provide comfort for the family of Ethel Barrett with a meaningful gesture of sympathy. 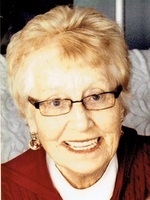 To send flowers in memory of Ethel Mae Barrett, please visit our Heartfelt Sympathies Store. As per Ethel's request there will be no service at this time. Provide comfort for the family of Ethel Mae Barrett by sending flowers. Richard Coombs Very sad to learn of ethel's passing.....she was an angel in every sense. She cared for our mom in her declining years in Gander. God speed & I feel she is with all those (in heaven) she loved & those who loved her. Forever remembered. RIP.